Site-directed mutagenesis is an efficient method to alter the structure and function of genes. Here we report a rapid and efficient megaprimer-based polymerase chain reaction (PCR) mutagenesis strategy that by-passes any intermediate purification of DNA between two rounds of PCR. The strategy relies on the use of a limiting concentration of one of the flanking primers (reverse or forward) along with the normal concentration of mutagenic primer, plus a prolonged final extension cycle in the first PCR amplification step. 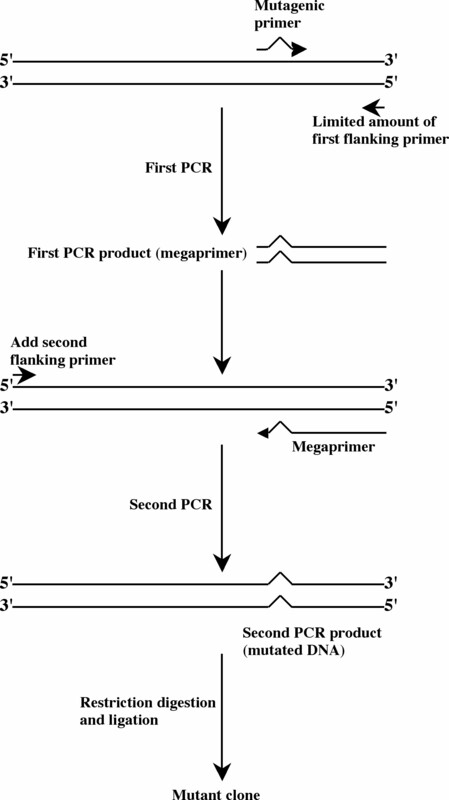 This first round of PCR generates a megaprimer that is used subsequently in the second round of PCR, along with the second flanking primer, but without the intermediate purification of the megaprimer. The strategy has been used successfully with four different plasmids to generate various mutants. This strategy provides a very rapid, inexpensive and efficient approach to perform site-directed mutagenesis. The strategy provides an alternative to conventional megaprimer based site-directed mutagenesis, which is based on an intermediate gel purification step. The strategy gives a high frequency of mutagenesis. Oligonucleotide-directed mutagenesis is one of the most popular methods to introduce site-specific alterations into a DNA sequence. In past few years, various protocols have been established for site-directed mutagenesis, which facilitate the analysis of gene expression and function. Currently, various PCR-based mutagenesis strategies are available but among them 'megaprimer'-based PCR has been used widely because of its simplicity and low cost . Kammann et al. originally developed the megaprimer-based mutagenesis strategy. Later, various changes have been suggested [3–7] to the original strategy. These megaprimer-based mutagenesis strategies are easy to use and they are very cost effective. The strategies require two rounds of PCR amplification using two flanking primers and one internal mutagenic primer. In the first round of PCR, one of the flanking primers and the internal mutagenic primer (having desired base substitutions) are used to generate a megaprimer. The megaprimer is purified by gel electrophoresis and extraction before being used along with the other flanking primer in the second round of PCR to generate the complete DNA sequence with the desired mutation. Most of the reported megaprimer mutagenesis strategies rely on the intermediate purification of megaprimer after the first round of PCR amplification to remove the unused primers. This requires the use of cumbersome and time-consuming gel extraction steps. Three megaprimer based site-directed mutagenesis strategies are available at present that circumvent the gel purification step. The first one uses various restriction enzymes to cleave the first and second PCR templates and enzymatic removal of remaining primers from the first PCR reaction . Since this strategy is based on the use of DNA-modifying enzymes at various steps, it is complicated and expensive to use. In the second strategy the melting temperature (Tm) of the forward and reverse flanking primers play a critical role . A megaprimer is generated using a low Tm flanking primer and a low annealing temperature. The second PCR is carried out in the same tube and uses a high Tm flanking primer that prevents priming by the low Tm primer from the first PCR reaction, thereby obviating the need to gel-purify the megaprimer after the first PCR. However, the strategy is limited by the need to design primers in which one has a Tm that is substantially higher than the other; moreover, the average mutant frequency is approximately 80%. The third single tube strategy utilizes the three primers, including mutagenic primer, in three steps of PCR amplification to generate the mutant using different combinations of primers . The average mutagenesis frequency obtained with this strategy is about 50%. The complex, three-step PCR protocol, along with the lower average mutagenesis frequency, makes this strategy limited in use. In this paper we describe an efficient and inexpensive single-tube two-step megaprimer-based PCR mutagenesis strategy (Fig. 1) that by-passes the cumbersome and time-consuming gel purification step, does not require additional expensive DNA-modifying enzyme treatments, is not restrictive in primer design, and has a high mutational efficiency. This strategy has been applied successfully to generate mutants of four different proteins; namely, acetohydroxyacid synthase (AHAS) from Arabidopsis thaliana, the catalytic and regulatory subunits of Saccharomyces cerevisiae AHAS, and Escherichia coli ketol-acid reductoisomerase (KARI). To illustrate this strategy, quantitative results obtained with KARI are presented in this paper, together with semi-quantitative analyses for the remaining three constructs. The average mutagenesis frequency obtained with this new strategy approaches 100% under optimal conditions. Outline of the new strategy described in this paper. The first PCR (5 cycles) contains a limiting concentration of the first flanking primer and is followed by a prolonged extension step. The second flanking primer is then added and the entire mutated template is amplified by PCR (25 cycles). The second PCR product is digested with appropriate restriction endonucleases to give desired mutated fragment, which then can be ligated to the expression vector. We tested our new strategy by making a KARI mutant. The first PCR contained 0.05, 0.1 or 1.0 pmole of the first flanking primer (T7 terminator). The second PCR products (1837 bp) (Fig. 2, lanes 1–3) were cloned into the pPROEX™HTb vector, and used to transform E. coli CU505 cells. To calculate the mutagenesis frequency of the new strategy, several colonies from each experiment were picked and sequenced (Fig. 2). A mutant frequency of 100% was observed when 0.05 pmole of the first flanking primer was used in the first PCR, but the efficiency decreased drastically (36%) when a normal amount of primer (1.0 pmole) was used. As we had anticipated, there is a lower percentage of mutant clones as the amount of the first flanking primer increases, presumably because residual first flanking primer is competing with the megaprimer in the second PCR, thereby amplifying the wild-type sequence. A limited amount of the first flanking primer is a key step in our new strategy. Agarose gel representing the results of megaprimer based PCR mutagenesis products and effect of limiting first flanking primer concentration on mutation frequency. Lanes 1, 2 and 3 are results obtained using 0.05, 0.1 and 1.0 pmole of the first flanking primer (T7 terminator) in the first PCR reaction. Lane M contains 1 μg of GeneRuler™ DNA ladder mix. The second PCR (1837 bp) product was purified from the gel. It was subjected to double restriction digestion using BamHI &HindIII. The resulting fragment (1482 bp) was cloned into the expression vector. The clones were sequenced to calculate the mutagenesis frequency. The advantage of prolonged final extension steps was demonstrated in an experiment where the amount of the first flanking primer was lowered (0.05 pmole) but the prolonged final extension step was omitted. Under these conditions, almost no second PCR product was obtained (Fig. 3, lane C). Agarose gel representing the results of the importance of prolonged extension cycle. Lane M contains 1 μg of GeneRuler™ DNA ladder mix and lane C shows the results of an experiment using 0.05 pmole of the first flanking primer but conducted without prolonged extension cycles. Our new strategy was applied to three other templates, using diagnostic restriction digestion to estimate the mutation efficiency without performing sequencing. 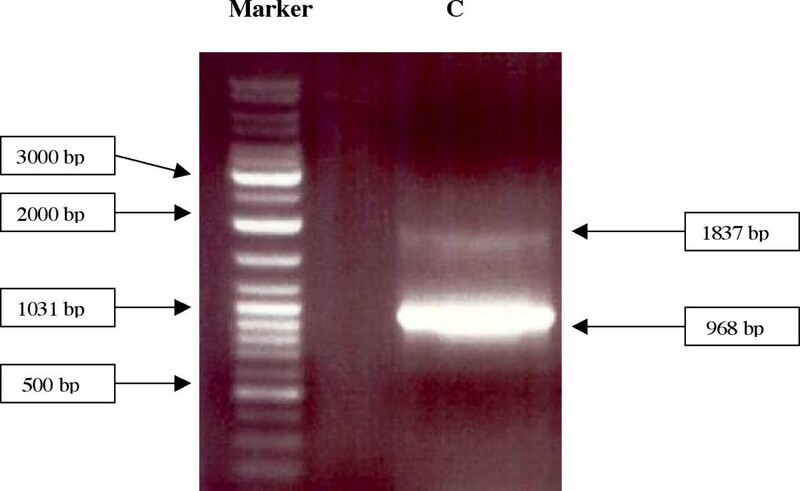 In the case of the N346H mutation in the regulatory subunit of AHAS from A. thaliana , the second PCR product obtained using 0.05, 0.1 and 1.0 pmole of the first flanking primer, when digested with KpnI, showed different relative band intensity patterns when run on 1% agarose gel. 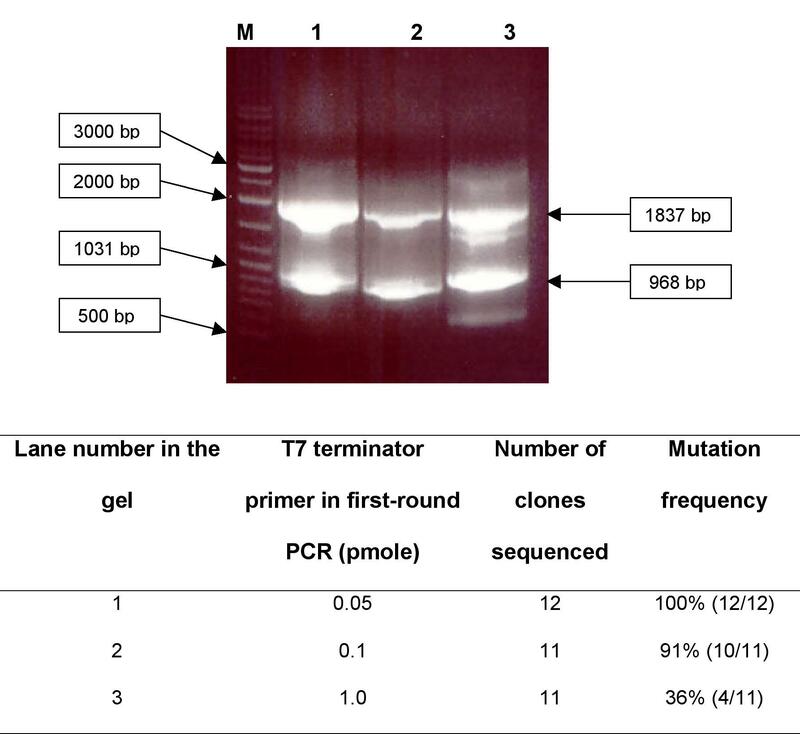 The second PCR product obtained using 0.05 pmole of the first flanking primer showed only the bands corresponding to the anticipated mutant with no band of undigested (wild-type) product. In the 0.1 and 1.0 pmole experiments, a mixture of both wild-type and mutant was observed. The intensity of bands corresponding to mutant was very strong as compared to the wild-type for the 0.1 pmole experiment, while for the 1.0 pmole experiment an opposite banding pattern was observed. These results are consistent with our quantitative measurements on the KARI mutant. The strategy was also used to construct mutants of the regulatory subunit (D224A; Pham et al., unpublished) and catalytic subunit (M354V; ) of S. cerevisiae AHAS. The D224A mutagenic primer removes an EcoRV recognition site, while the M354V primer introduces a restriction site for ApaLI. Both mutations were tested using the same three different concentrations of first flanking primers. The results obtained from both of these mutants were in agreement with those obtained with the N346H mutant of A. thaliana AHAS. The main reason for using a gel purification step after the first PCR in conventional megaprimer mutagenesis is to remove excess flanking primer. Without this step, the second PCR would contain both of the flanking primers and substantial amounts of wild-type product would be obtained. One of the novel features of our strategy (Fig. 1) is that the amount of the first flanking primer is limited, so that it is substantially depleted during the first PCR. This, in turn, leads to the second novel feature of our strategy, a prolonged extension step at the end of the first PCR. Because the amount of the first flanking primer is limited, a relatively small number of PCR cycles are sufficient to reach an end point. However, the small number of cycles constrains one of the essential features of PCR: full-length products accumulate exponentially while incomplete products accumulate arithmetically. Therefore, after just a few PCR cycles, full-length products will not overwhelm the partial products. We overcame this problem with a final and prolonged extension step, so that all of the partial products are converted to full-length products. The second flanking primer is added after the first PCR step; no other additions or manipulations are necessary, in contrast with other single tube PCR strategies that have been described previously [8–10]. Most of the megaprimer strategies are limited in the length of the megaprimer to about 300 bp . The length of megaprimer does not limit our strategy, which can be used for in excess of 1 kbp long megaprimers (Table 1). This strategy is also useful in terms of PCR set up; it is only necessary to program the software to pause between the two PCR stages, while the second flanking primer is added. Mutations, primers and restriction enzyme recognition site added or removed. In the primer sequences shown, bases that differ from the wild-type are shown in lowercase and the altered codon is underlined. Boxes enclose introduced restriction enzyme recognition sites, while strikethrough shows a restriction enzyme recognition site that is removed. The designations (F) and (R) indicate forward and reverse primers, respectively. The results of sequencing experiments in the case of the KARI mutant, and diagnostic restriction digestion in the case of other three constructs, show the versatility of our strategy. Although there are currently three single PCR tube strategies available, ours is simpler and yields mutagenesis frequencies approaching 100%. We suggest that it could be applied to most constructs making it a simple but universal strategy for site-directed mutagenesis. All PCR experiments were performed on a Perkin-Elmer 480 thermal cycler. Restriction enzymes, DNA ligase and DNA polymerase were obtained from New England Biolabs. Deoxyribonucleotide triphosphates (dNTPs) were purchased from Promega and the primers were obtained from Sigma-Aldrich Pty. Ltd. The mutagenic primers (Table 1) differed from the wild-type sequence by containing substitutions to change one amino acid residue. Mini preparation of plasmid DNA was performed using the Promega Plasmid Preparation Kit. Our new strategy has been applied to four different proteins but for illustration the strategy to construct a mutant of E. coli KARI will be described in detail. Isolating clones followed by DNA sequencing was used to assess the success of the strategy. For the other three enzyme constructs, the designed mutagenic primers contained altered restriction enzyme recognition sites to permit facile screening for the mutant (Table 1). In one case; the target codon change was chosen so as to create a restriction enzyme recognition site, while in a second case an existing site was removed. A third mutagenic primer contained a second substitution that is silent with respect to the protein sequence but which introduced a restriction enzyme recognition site. The resulting mutants were screened using diagnostic restriction digestion. The ilvC gene (1482 bp) encodes KARI and the gene product is a single polypeptide with a deduced molecular weight of 54 kDa . We have described previously the cloning of the gene into the pET30a(+) vector . The pET-C (6879 bp) plasmid was used as the template. This new strategy consists of two rounds of PCR amplification. In the first round, the reaction was carried out in total volume of 50 μL and contained 2 U of Vent polymerase, 1X ThermoPol PCR buffer (10 mM KCl, 10 mM (NH4)2SO4, 20 mM Tris-HCl (pH 8.8 at 25°C), 2 mM MgSO4 and 0.1% Triton® X-100), 50–100 ng of pET-C DNA, 0.2 mM dNTP, 1.0 pmole of internal mutagenic forward primer (Table 1) and 0.05 pmole of the reverse flanking primer (T7 terminator, GGTTATGCTAGTTATTGCTCAGCGGTGGC). The PCR was carried out under the following conditions: denaturation, 95°C for 1 minute; annealing, 50°C for 30 seconds; and extension, 72°C for 2 minutes. This cycle was repeated 5 times and followed by an additional extension step at 72°C for 35 minutes. In the second round of PCR, the forward flanking primer (T7 promoter, CGCGAAATTAATACGACTCACTATAGGGG) was added into the same tube. After an initial denaturation of 96°C for 1 minute, 25 PCR cycles were used as follows: denaturation, 96°C for 1 minute; annealing, 55°C for 1 minute; and extension, 72°C for 2 minutes. These cycles were followed by an additional extension step at 72°C for 10 minutes. The second PCR product (1837 bp) having desired mutation was purified and digested with BamHI and HindIII to give a mutated ilvC gene fragment (1482 bp). The resulting fragment was purified and cloned into the expression vector pPROEX™HTb (4779 bp) (Gibco BRL) after digesting vector with BamHI and HindIII. The resulting mutant plasmid (6192 bp) was used to transform E. coli strain CU505 (Purdue University, Indiana, USA) competent cells and 10% of the transformed culture was cultured on Luria-Bertani agar plates supplemented with 10 μg/ml ampicillin. The plasmid isolated from selected colonies was sequenced using BigDye™ Terminator chemistry at the Australian Genome Research Facility (Brisbane, Queensland, Australia). We thank Siew Siew Pang, Yu-Ting Lee and Sophia Pham for donating clones and oligonucleotides used in these studies. We also thank Linda Widjaja for assistance in preparing figures and tables. This work supported by the Australian Research Council, Project ID DP0208682. RT has prepared the manuscript and performed all the experiments. RL gave suggestions for the initial experiments used to establish strategy. RGD gave suggestion for the experiments, helped in preparing and revising the manuscript. All of the authors have read and approved the final manuscript.